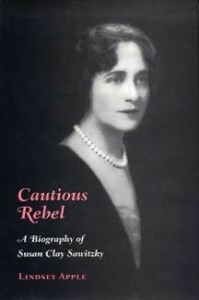 Susan Clay Sawitzky (1897-1981) was born into a traditional Kentucky family dominated by the lingering renown of its patriarch and Susan’s great-grandfather, Henry Clay. Family and community expected Susan to take her place on the pedestal of Southern womanhood, but Susan reached maturity at the height of the first women’s movement and heard the promises of that movement. In the late 1920s she attempted to live independently, the startled everyone by eloping and moving to New York City with William Sawitzky, a divorced Russian emigré. For sixty years Susan Clay Sawitzky struggled against the values assimilated in her youth, ideals shared by her Old World husband and American society in general. She wrote poignantly about confinement and freedom in the privacy of her study and published a small amount of poetry and art history. But she was not an exceptional woman; she could not take the risks necessary to achieve the degree of success she coveted. The detailed record she left reveals the forces, both subtle and complex, that compromised her dreams and accomplishments. Lindsey Apple employs nearly seventy years of Susan Clay Sawitzky’s personal letters and poetry to reconstruct the world of a woman seeking modernity with “the millstone of tradition” upon her shoulders. Lindsey Apple is a professor and chair of history at Georgetown College. He is editor, with Ann Bevins and Frederick Johnston, and one of the authors of Scott County: A History and has published articles in The Register of the Kentucky Historical Society and other journals.